Currently home of the Wok-In Restaurant (as of 2015), the building, which was built in 1877, formerly housed the Chinese Nationalist League (CNL) Branch of Kingston. The main branch of the CNL was established in Kingston on June 24, 1915. It was also known as the Guomindang or GMD. The location of the CNL’s first building is unknown, however on August 3， 1920, the league moved here to 30 Montreal Street. The CNL was associated with the Chinese Nationalist Party in China. This was the ruling organization in China who had revolted and overthrown the imperial Manchu government of the Qing Dynasty in 1911. This party was committed to a united China and a government based on democratic principles. The CNL established branches overseas in order to spread its political message of “Nationalism, democracy, and people’s livelihood” and to gain foreign support. 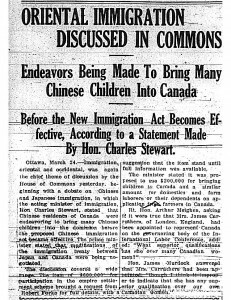 Many prominent members of Kingston’s Chinese community were affiliated with the CNL. 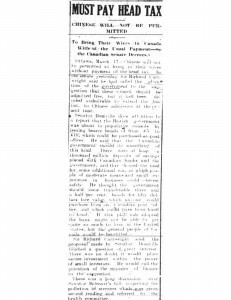 In 1919, the CNL registered as an Ontario political party. Annually, the CNL would celebrate its founding with a ceremony and feast on “National Day” which occurred on January 1st. The organization also fulfilled an important social function, serving as a place for members to socialize. 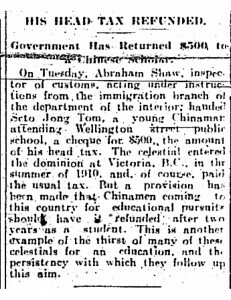 In this way, the CNL acted as a support for many overseas Chinese across North America. 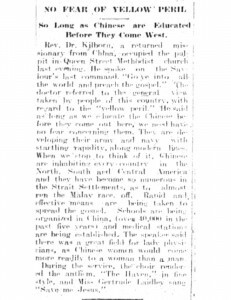 In addition, the organization functioned as a meeting ground for non-Chinese members of the community. Evidence suggests that non-Chinese participation was encouraged in the CNL. Non-Chinese members are listed in the administration and can be seen in National Day photographs dating back to 1923.